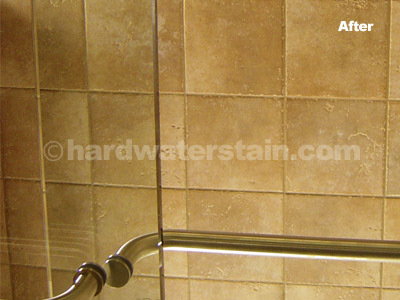 You've found the "Ultimate Hard Water Stain Remover®". Watch this! If you're like countless others, you've searched the internet high and low on a quest to find a truly effective hard water stain remover that actually works without all the smelly fumes and dangerous chemicals found in many popular formulas. In search of a safe formula you can use around your home, you've possibly even tried to mix up every combination from every YouTube video you can find, but still haven't been able to rid your shower doors or windows from the hard water stains that seem impossible to remove. 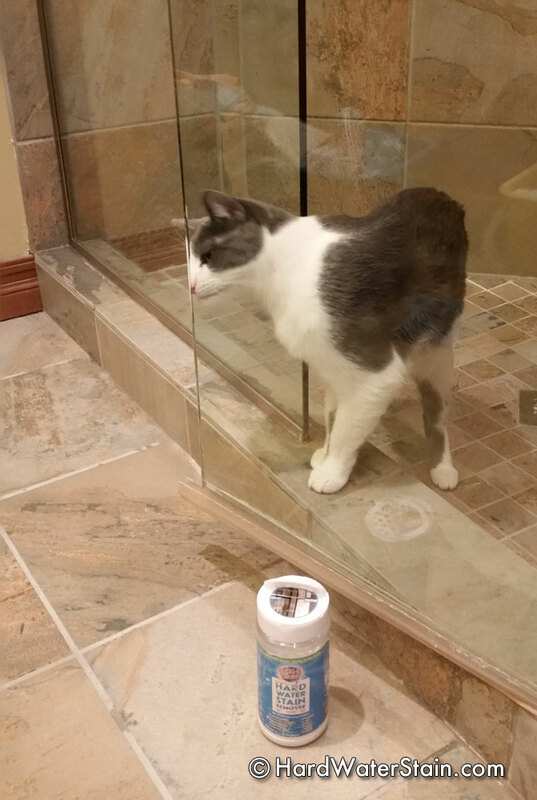 Our formula is consumer tested and kitty approved! 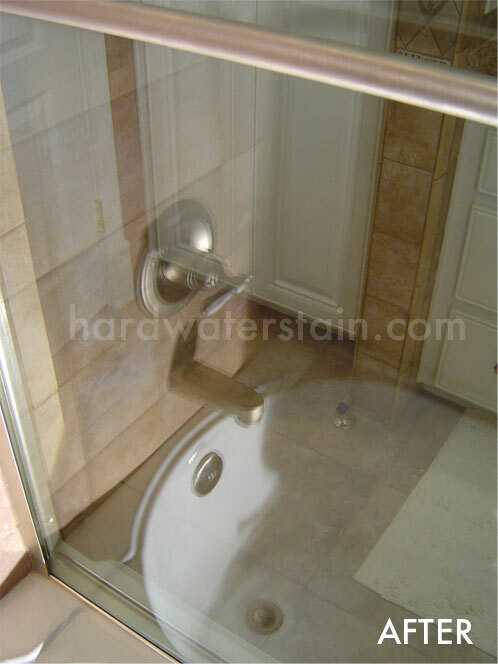 Now you need look no further, you've found our family's formula that we use professionally each work day to remove stubborn hard water stains and hard water spots from our client's windows, shower doors, sinks and toilets. 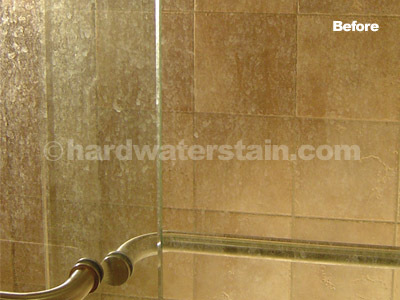 One of the BEST reasons to rely on Brite and Clean Ultimate Hard Water Stain Remover® is because we do too. Because we serve very particular types of clients, we must be able to do the very best job to satisfy their requirements. Our professional window cleaning company, Brite & Clean Windows, has been the proving grounds of the Ultimate Hard Water Stain Remover® for the past 25 years. Looking for a safe and effective way to remove the most stubborn hard water stains and water spots from glass, granite, porcelain, stainless steel, chrome and fiberglass surfaces? 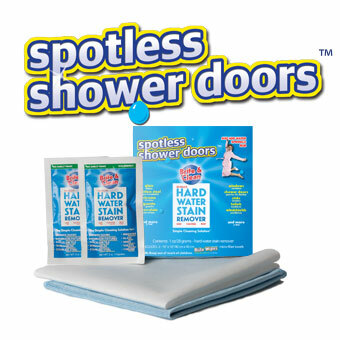 Fed up with hard water stain build-up on your shower doors and windows that you just can't seem to remove? Look no further. You've found the Ultimate Hard Water Stain Remover® for hard water stain removal ... used by professional cleaners and individual homeowners alike. 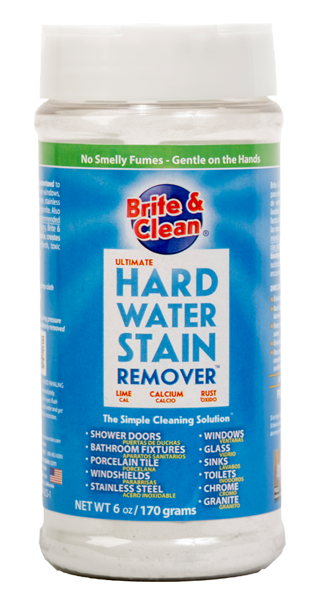 BRITE and CLEAN's™ Ultimate Hard Water Stain Remover® is not like most other hard water stain removers on the market. 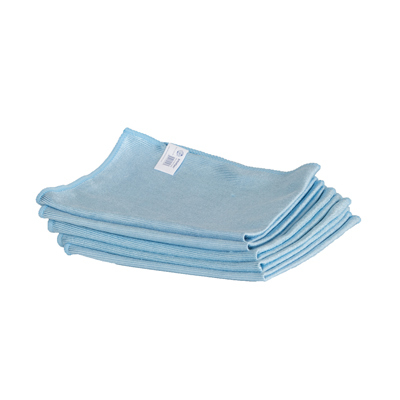 Most other cleaning chemicals are liquids and create fumes that you have to breathe in while cleaning. 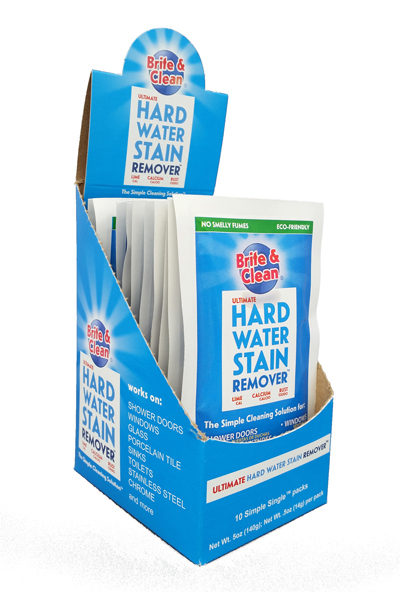 The Ultimate Hard Water Stain Remover® is a safe, bio-degradable powder that has no detectable odors or fumes. Trusted for years by thousands of satisfied customers to get hard water stains and water spots off windows, shower doors, sinks and toilets, faucets and tile in both bathrooms and kitchens ... you will be glad that you have found a simple cleaning solution for hard water stains. The cleanest my windows have been in years! Thank you. Cleaned 10yr old hardwater off windows. Finally got to use your product Saturday and the product is all that you claim it to be. My glass enclosed shower doors came out sparkling. Is your product available in stores? 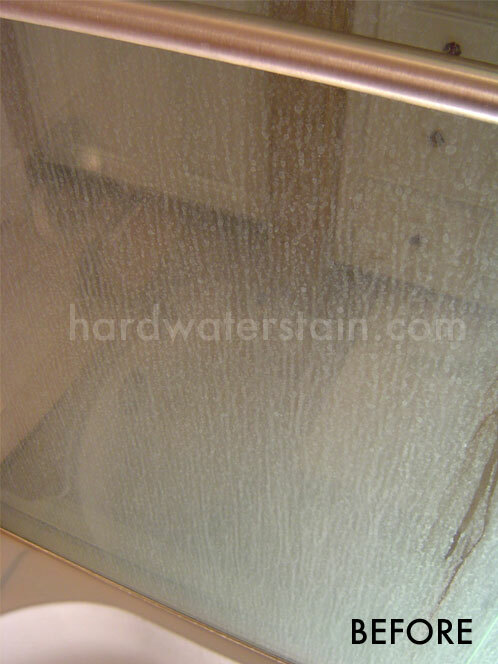 Order the Ultimate Hard Water Stain Remover® today and get rid of those hard to remove water spots in your home's kitchen and bathroom. Each can contains 6 ounces by weight and is capable of removing stubborn hard water stains on up to 700 square feet of glass, granite, porcelain tile, sinks, toilets and stainless steel sinks. 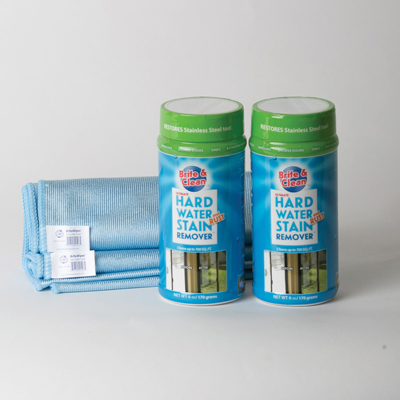 Brite & Clean’s™ Simple Cleaning Solution® hard water stain remover is “cleaning for good”. Not only is our formula the best for removing hard water stains, lime scale and rust stains, every can you purchase helps create jobs for American’s with physical & mental disabilities.